Have been working on this (and variations) this past week. 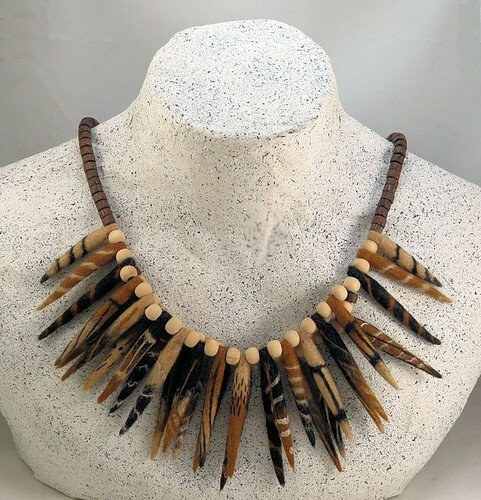 Used very "tribal" colors for this particular necklace, but have been doing experiments with a lot of different color combinations. Not certain that I will spend the time to make enough for necklaces of all the variations, but probably will do at least one more. At first I thought "what a dangerous looking necklace"...and then I realized it was you...and that the pieces were felted...incredible detail and coloring, Harlan! The points look very pointy! I bet they took forever...all the little variations...just beautiful! what an interesting piece! It's very lovely. I like how it takes some time to see that the necklace is actually made of felt. It is a beautiful necklace, very creative too. So we'll done. I think some earrings would go great with this, made so single "beads". Amazing. I really thought it was porcupine quills from the thumbnail. Your felted spikes are so pretty. Earrings would be a very good addition (and I recently invested in the tools to make my own earring wires) - I'll have to get on that!! I don't think the spikes would make a good bracelet unless they were much smaller and limited in length - perhaps different "beads", but in the same colors and making use of the same designs would coordinate enough to make an ensemble. I do need to find myself a better reed mat for wet felting - I'm using a placemat that I found at the dollar store and it works, but it has some flat sections in it that were dyed red which bleeds - hasn't discolored any of my fibers, but my hands have sometimes looked like I had rubbed them raw!! LOL!! Here are some of the other color combinations I have tried - currently doing more spikes in the green/cream range of colors. - Tried to upload a photo, but it doesn't seem to show up. Sorry. This is awesome and I love it so! - the concept of felted spikes is neat as well!